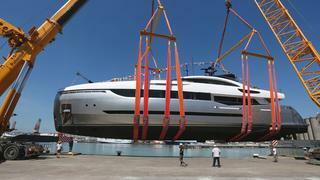 The 40m Columbus Sport Hybrid motor yacht was launched last weekend at the Palumbo yard in Naples. The all-aluminium semi-displacement yacht was ordered by a Russian client in 2011 and features naval architecture, exterior styling and lines by Sergio Cutolo of Hydro Tec. The 40m yacht is engineered to have low fuel costs and environmental impact. Its hybrid propulsion system enables the yacht to run at a low speed of 7.5 knots on two generators with the main engines turned off, thus reducing NOx and SOx emissions. The electric engines are also quick to respond and thus useful when manoeuvring in port. Quiet too, they are ideal for night time navigation. Fuel consumption is also reduced by having a light aluminium semi-displacement hull and superstructure. The design of the yacht allows expansive views of the sea out of large windows in the main saloon together with sliding doors and opening bulwarks. Spacious deck areas include a flybridge sundeck and beach club at the stern. At 180GT (with a 8.2m beam) interior volumes are impressive for a yacht of this size, incorporating accommodation for up to nine guests in an owner’s suite and three guest cabins. Interior design is by the shipyard team in collaboration with Italian studio Hot Lab and the owner. Woods used in the decor include teak, sycamore, grey durmast American walnut and eucalyptus, while interior floors are in light oak. In line with the yacht’s environmental focus, all woods used are FSC (Forest Stewardship Council) certified to ensure eco-sustainability. Highlights are provided by brightly colored leather (treated with a special non-toxic water painting process), Breccia Sarda and Adria Venato marbles, satin gold finishes on metal details and soft wool carpets. Antonio Romano of Hot Lab describes the overall effect as ‘modern chic’, a light, warm, relaxing interior that the owner will be able to use for many years without getting bored.